The new Meguiar's DA Microfiber Finishing Wax is an outstanding AIO (All In One) product that can polish and protect in one step. Unlike many other AIO products this product offers serious corrective power that safely removes very light surface imperfections with ease. At the same time it's leaving behind a coating of wax that will protect the paint from nature's harshest elements and enhance the finishes appearance. The Meguiar's DA Microfiber Finishing Wax should be used exclusively with the Meguiar's DA Microfiber Finishing Disc Buffing Pad and a dual action buffer like Porter Cable 7424 XP. The entire system was designed to work with these three components together so it's critical you have all three. Meguiar's also highly recommends using their backing plates because they have a shorter loop on their model (Meguiar's Professional Backing Plate W67DA 5" or S6BP 6"). This helps reduce the amount of heat generated, which in turn preserves the life of the pad. When you apply the product you need to prime the pad thoroughly by applying the finishing wax all over the pad. If any areas look dry manually spread the product with a clean hand so the entire pad has little bit of product covering it. From then on you only need about two to four small drops for each 2ft x 2ft section. Use the buffer at speeds 3 - 4 with light to medium pressure for optimal results and you'll quickly see the surface imperfections fade and a vibrant shine appear. The shine looks incredible and you'll be happy to know the paint is protected. If you want to remove slightly deeper surface imperfections we recommend using the Meguiar's DA Microfiber Correction Compound before hand. Meguiar's DA MICROFIBER CORRECTION SYSTEM is a unique purpose engineered system of new technology, microfiber pads and liquids for optimal results. Meguiar's DA Finishing Wax utilizes mild cleaners, polymers, silicones & carnauba to refine the paint surface after applying Meguiar's DA Correction Compound, while leaving durable high gloss protection. Designed for use with Meguiar's DA Microfiber Finishing Disc providing no sling, low dusting performance with one-pass wipe off. DIRECTIONS: SHAKE WELL. Work in the shade on a cool surface. Apply product directly to Meguiar's DA Microfiber Finishing Disc. Set Dual Action Polisher to 3800 opm's. Work surface, applying 2-3 light pressure passes. 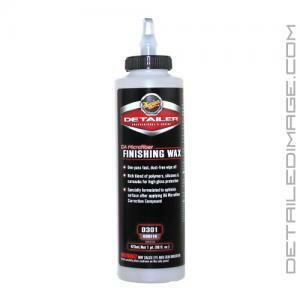 Wipe residue off using Meguiar's Ultimate Wipe Detailing Cloth (M9910). PROFESSIONAL TIPS: Clean microfiber disc frequently using Meguiar's Pad Conditioner Brush (WPCB) or regulatory approved air nozzle. The Meguiar's DA Microfiber Finishing Wax may be applied to entire vehicle prior to wipe off. I just bought some of this. I have a coating of Crystal Syrum Light applied, going on 1.5 years and working great still. I do apply a good sealant approx. every 3 months. I'm not ready for any major correction in polishing, but could use a light polish. Used this on a white Audi with a white LC CCS pad. This stuff leaves a very slick finish that lasted for several weeks, survived a few rain storms and washes. Can't beat it for the price, great for a quick clean-up and base for a more robust LSP. It works great! The instructions by DI and on the bottle definitely gives ultimate results!